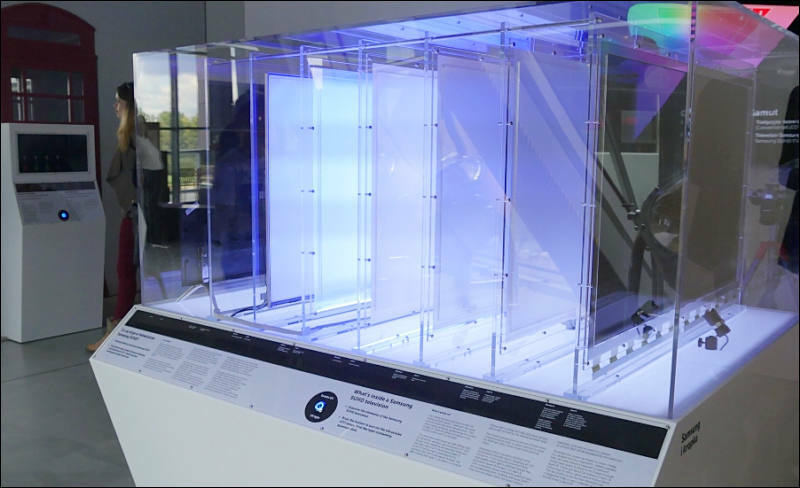 Idea behind this displays is to use quantum dot effect making very sharp spectrum peaks for red, green and blue. Such approach allow to improve color gamut while keeping energy efficiency. 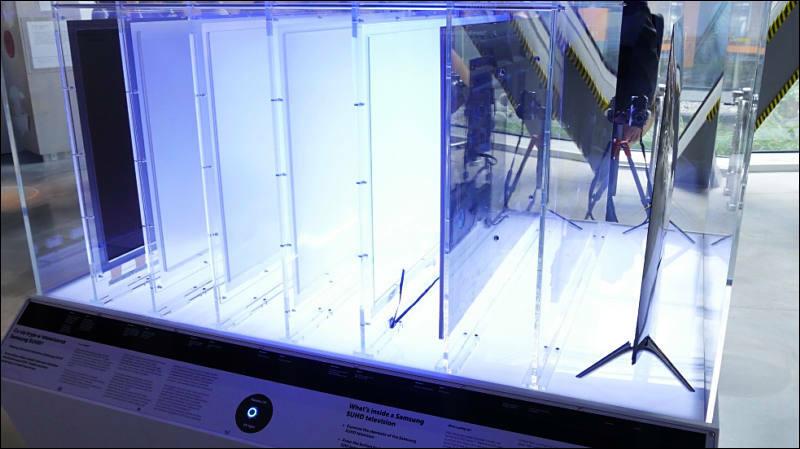 Sony’s approach uses an uncoated LED inside a thin glass tube packed with red and green quantum dots supplied by Massachussetts company QD Vision. When the dots get blasted with electricity, they only emit light at their characteristic wavelengths, which, combined with the blue light from the LED, form a white light that’s more intense at those three points. It is used in their TV, Monitors, tablets and phones. HiSense introduced a 4K quantum-dot “Wide Gamut TV,” which uses QDEF film rather than the QD Vision rail. It will enter the Chinese market in March; U.S. in the summer. Maximum size is 85 inches, and there is an H.265 decoder built in. As I have it I can only fully agree. I have 2 triluminos displays (Sony Vaio Duo 11, Flip 15A 1620p) It certainly better than other LCDs, but the black level isn't that great in low light. The galaxy tab S 10.5 OLED display is much better in uniformity and absolute black. It certainly better than other LCDs, but the black level isn't that great in low light. The galaxy tab S 10.5 OLED display is much better in uniformity and absolute black. This tech has nothing to do with black level (of course, premium displays also use various tech to reduce black levels) :-) And OLED will be better as it has no backlight, just oleds are off. Does the Kindle Fire HDX 8.9 work with the Panasonic Image app? If it runs on Android it must be no issues, just get APK file. The Nexus is a tiny bit bit brighter, but unless you use it at the beach, you won't need that. I found the display very good for reading, better than my Kindle. The Adobe 100 accuracy is very handy on the road for checking color. Lastly, Apple is always in 3rd place on these tests, but those screens look nice as well. If I had to do it over, I might go for the Amazon model with the built in sim based wifi for those moments on the road when there is no regular wifi. The Nexus works beautifully with my GM1. I've got a Sony TV now that uses the "Triluminous" technology, and I had a Sony TV before that used separate red, green and blue LEDs before. Trilumnious is visibly inferiour to the older (and certainly more expensive) separate LED technology. It's probably better than the abundant "white" LEDs, though. But the biggest visible disadvantages of the newer TV are not about color gamut, it's the glaring screen surface and the "edge lighting", which is not quite as good as the true local direct backlight dimming the older TV employed. All in all, I currently see a "better than 5 year old technology" picture only from OLED displays. Trilumnious is visibly inferiour to the older (and certainly more expensive) separate LED technology. Visibly? Or you have measurements? Most of older top sets you talk about were targeted to rich users, so were set for wide gamut and heavy use of local dimming (btw I do not remember any that use individual dimming, blocks only). First, only top models used three color direct led (with big number of leds) backlight. Glaring surface has nothing to do with it at all. Btw, also as edge led, if they wanted they can use it for direct backlights, it is just too costly and few see the difference. So, it is false statement. Display tech progress is quote easy to see. Btw, oled picture really hardly changed for last 5 years :-). The tiny dots are great. I'm all for highest resolution etc. But I feel like I've gotta say that the name "Quantum Dot" [TM] is a misnomer. In physics, a quantum (plural: quanta) is the minimum amount of any physical entity involved in an interaction..
What these people are selling is really, really tiny dots but nothing to do with quantum. (Just saying). BTW, Dr Karl (Karl Kruszelnicki) often reminds us that every time he hears the word Quantum outside Quantum physics, he suspects a hoax of some kind. As I understand term is common in the industry and is not used by one company only. Korea-based vendors are developing quantum dot TVs in order to expand their high-end TV range, according to sources quoted in a report from Korea-based Digital Times. Both LG Electronics and Samsung Electronics are reportedly developing the technology for units that may be released as early as 2015. The move would give the companies increased influence in the high-end TV segment where they both are currently focused on development of Ultra HD and OLED TVs, the report said. It turns out that CIE 1931 works well for monitors that use transmissive technology with a broadband light source. OLEDs are emissive because their light is generated by individual pixels on the front of the display: they aren’t filtering another light source, each pixel is creating very pure, narrow spectrum hues from scratch. CIE 1931 also fails in displays that use narrow spectrum transmissive light sources. Many LED LCD monitors** work in the traditional way, by filtering light from a single type of LED into red, green and blue components, but some manufacturers use very narrow band red, green and blue LEDs to create richer hues. ** CIE 1931 works with the former, but the latter requires the Judd offset. In both of these circumstances the narrow bandwidth of the emitted spectrum results in very pure color and a larger color gamut, but white balancing the monitor to CIE 1931 standards results in a monitor that looks green compared to a CRT reference. (This is due to a property called “metameric failure.” Calibration instruments will say that the white balance is correct, but by eye it’s clearly not… until the Judd offset is applied. The world's biggest TV makers, Samsung Electronics Co Ltd and LG Electronics Inc, are turning to quantum dot technology for their next-generation TVs as it could still be years before OLED is affordable for the mass market. And this is just some bunch of lie. 55" LG OLED is around 3x in price if you look carefully, sometimes less. Plus for TV to be 35% more panel price must be almost double, while all this QD can be made really cheap in mass production. Btw, QD solve no actual problems, as most TV already have wider color gamut than sRGB. Just some marketing. LG Electronics (LG) will unveil a new 4K ULTRA HD TV with quantum dot technology as a new component of its expanded TV lineup at the 2015 International CES®, Jan. 6-9 in Las Vegas. LG’s 4K ULTRA HD TVs with quantum dot technology will offer a wider color palette and improved color saturation than conventional LCD TVs and will be available in 2015 to complement LG’s other ULTRA HD TV and OLED TV offerings. OMG. Marketing fuckers. Actual measurements show that their TV already can show full sRGB space. QD was made for phones and tablets to reduce energy consumption, so, proper way is to monitor them as more energy efficient. China-based vendor TCL has launched quantum-dot LCD TVs with a NTSC value of 110% through technological cooperation with US-based QD Vision, with Ultra HD panels supplied by affiliated China Star Optoelectronics Technology. TCL was quoted by Twice at a news conference stating its 55-inch 4K Ultra HD quantum-dot TVs with Color IQ technology will be available soon in more than 2,000 stores throughout China. The new H9700 TV offers image performance superior to OLED, claimed TCL. Samsung Electronics, LG Electronics, Sony and China-based TCL and Hisense, are expected to launch quantum dot (QD) models for market differentiation in 2015, according to Taiwan-based supply chain makers. Sony already launched QD LCD TVs through cooperation with US-based QD Vision as early as the second half of 2013, the sources said. Production cost for a QD LCD TVs is US$100-150 higher than that for an ordinary model, the sources said. Global QD LCD TV shipments will reach two million units in 2015 and increase to 26 million units in 2020. Increased models of QD-LCD TVs from Sony, TCL, LG Electronics and Samsung Electronics are expected to hit the market in 2015 due to their wide color gamut advantages that produce image quality comparable to OLED. 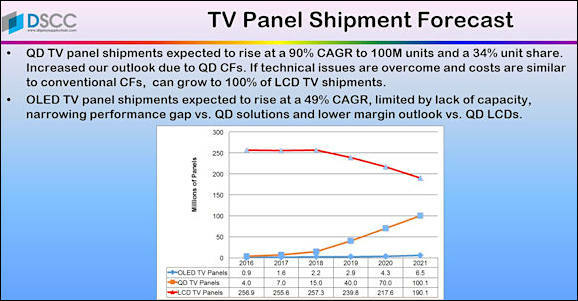 Shifting to QD LCD TVs would allow the vendors to maintain influence in the TV segment as they continue to develop OLED TV technology, which the Korea vendors still aim to develop in upcoming years as pricing comes down. 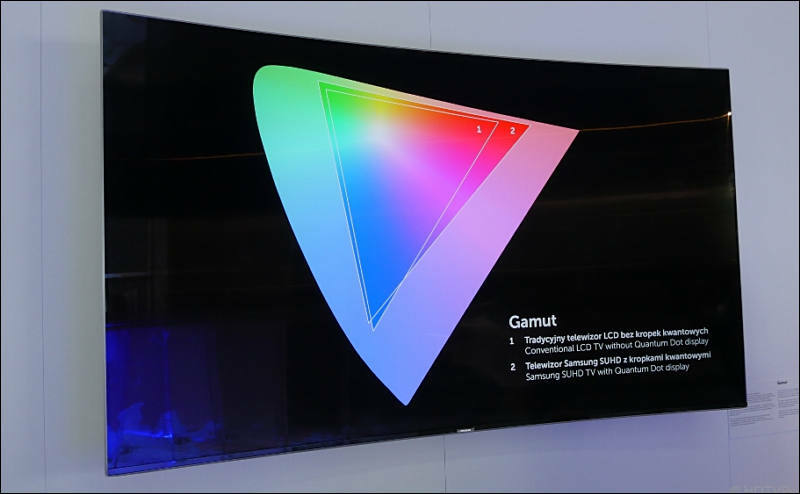 Wide gamut again, While OLED most important advantages have nothing to do with gamut. Although LCD displays dominate in the display market, they can only reach about 70% of the color performance of OLEDs. LCDs can reach the sRGB color gamut at best because of the white LEDs that are used as the backlight to illuminate the liquid crystal module (LCM). There are millions of pixels that are divided into three subpixels (red, green, and blue) in the LCM. The color of the subpixel is controlled by the efficiency of the filter and of the spectral energy of the white light from the backlight. To make a high quality color, the filter either needs to be very narrow, which will let less light through, or the specific color component from the white light must be narrow and tuned to the desired wavelength. The LED light source does not meet the requirement for narrow color peaks. Quantum dots can solve this problem owing to their narrow emission and high quantum yield. QD Vision and Nanosys are currently developing products that can easily be placed in existing LCD manufacturing. The quantum dots are packaged into either a tube (QD Vision) which is placed adjacent to edge-lit LEDs, or in a film (Nanosys) on top of the LED backlight. 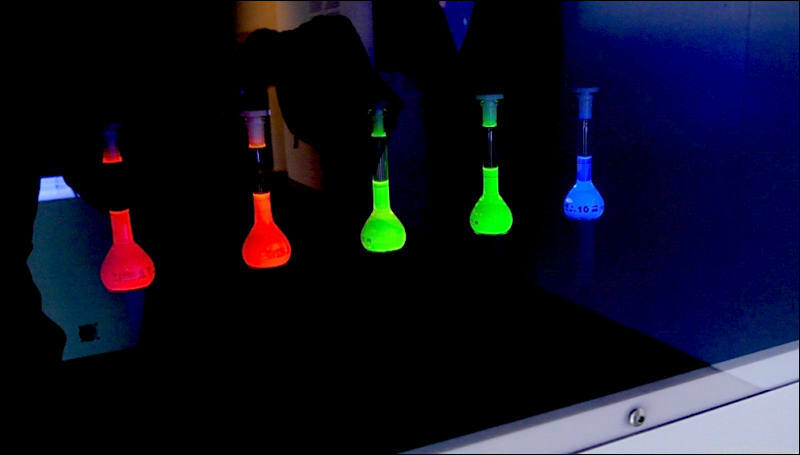 Recently, quantum dot LEDs are being researched as the backlight in displays. Kim et al. fabricated a full color QD display using a solvent-free transfer printing method to pattern the individual red, green, and blue emitting QDs onto the pixelated display panel. Previous methods of patterning QDs onto the pixels, such as spin-coating, cause a cross-contamination between the three sizes. Other methods lead to non-uniform films with a rough surface. This results in a decrease in the charge transfer and a decline of quantum efficiency. In the transfer printing method, QDs are spin-coated onto a surface modified donor substrate, followed by the application of a polydimethylsiloxane (PDMS) stamp to the QD film. Due to the surface energy of the stamp being less than that of the donor substrate, with sufficient pressure, the QDs are picked up. The QDs are then transferred to a device stack into an array of narrow stripes. Compared to a film that was fabricated using a spin-coated method, the density of the printed film has a 20% greater density of QDs. When integrated into an organic/inorganic hybrid LED structure, the printed red, green, and blue QDs had brightness values of 16,380, 6,425, and 423 cd m−2 and current efficiencies of approximately 3.00, 0.55, and 0.05 cd A−1, respectively.These values are about 25–52% greater than the values collected with the spin-coated device. The method of QD printing was employed to produce a 4-inch full-color active matrix QD display that showed a near perfect image. Due to the elastomeric PDMS stamp, this printing method can transfer QDs onto flexible substrates, which is necessary for scaling up to a roll-to-roll system. 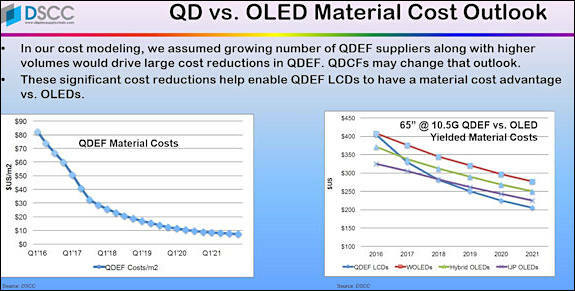 Light emissions based on QD materials is of two modes, photoluminescence and electroluminescence, with the former including types of QDEF (QD enhancement film) LCD, QDCF (QD color filter) LCD, QD-OLED hybrid, RGB (red, green, blue) QD LED and the later mainly being QLED. Samsung SUHD TVs are QDEF LCD type and QDCF LCD TVs. Samsung want to make wide color gamut reaching 98% of Rec. 2020 standards in 2017. I have no idea how. Check paper I provided above, normally you need laser sources for it, or best QLED with modified filters. Samsung Electronics plans to begin production of QLED TVs in 2019. QLED TVs will have lower production cost and longer service life than OLED models. However, production of QLED TVs currently is faced with technological problems, mainly short service life of blue-color QD materials and how to precisely and evenly coat red, green, blue QD materials. Again this blue color that is main obstacle in all OLED screens. Samsung Electronics, at the Consumer Electronics Show 2017 on early January, renamed its SUHD (super Ultra HD) TVs as QLED TVs, causing concern about development of quantum dot (QD) TVs. However, QLED is technologically much different from QD TVs, because QLED still uses LED backlighting, and thus QLED TVs are not true QD TVs by technological definition, according to WitsView. QLED TVs placing a QDEF (quantum dot enhancement film) over the LED backlight to increase color saturation performance. Samsung's choice of name may be motivated to differentiate the TVs from OLED TVs launched by LG Electronics. In the next couple of years, quantum dots placed in color filters used for liquid crystal displays will enhance brightness and efficiency, widen viewing angles (because quantum dots can emit in all directions without being polarized), remove the need for each pixel to be on 100 percent of the time because of where the quantum dots are positioned in front of the stack, and enable cooler temperatures because the quantum dots are farther away from the LED heat source helping their longevity.